Emily Ferrall, right, and Pallavi Sirajuddin with Georgia DNR search for bats in Frick's Cave on Saturday, Feb. 9, 2019, in Chickamauga, Ga. The cave is home to rare gray bats and is opened to visitors by Southeastern Cave Conservancy, Inc., just one day each year. Researchers with the Georgia Department of Natural Resources use the opportunity to survey the cave's winter bat populations and take cultures from bats suffering from white-nose syndrome. A group of biologists, state employees and volunteers traversed a protected North Georgia cave on a spelunking expedition to conduct research related to the white-nose syndrome wiping out millions of bats across North America, Asia and Europe. The cave — Frick's Cave in Walker County — is only open one day per year to protect the endangered species within. It is home to endangered gray bats, Georgia's only population of Tennessee cave salamander and more than 3 miles of surveyed cave with more yet to be explored. Wildlife biologist Trina Morris led the trip as others with the Georgia Department of Natural Resources and other organizations counted gray and tri-colored bats. The count will help biologists understand population trends and could help the tri-colored bat get listed as a threatened or endangered species. In the summer, more than 10,000 gray bats live in the cave. Most winter in other parts of the region, allowing researchers to come study the cave. Only 29 gray bats remained Saturday morning. Biologists aren't sure why, but a very small portion of the cave's bats remain during the winter months. The focus of Saturday's count, however, were the tri-colored bats, which are being decimated by white-nose syndrome. The fungus affects hibernating bats, waking them up and leaving them to die, often by freezing or starvation. The relatively new and not totally understood disease has ravaged the tri-colored population but hasn't seemed to impact the gray bats. The presence of the fungus was confirmed in 2014 when the bat population was approximately 1,500. About 75 percent of those bats had visible signs of the fungus the following year. By last year, the population had dropped to approximately 250. This weekend brought more dire news, as the count yielded 141 tri-colored bats, some of which had the telltale white fungus growing on their noses. "[The population is] down, it's defintely not good," Morris said. "But we don't know totally what it means." The drop doesn't necessarily mean all of them were killed by the disease, although that could likely have been the case for many. Changes in weather and other factors can contribute to population decline. Fellow Georgia DNR workers Emily Ferrall and Pallavi Sirajuddin followed a group of volunteers observing the count. They used clickers and swabs to count the bats and sample any showing signs of white-nose syndrome. Others in the group went ahead to count other areas of the cave and relay information. Since this population already has confirmed white-nose syndrome, they'll use the results as a baseline to test other populations in other caves. The only positive Morris and the crew have found from the disease is the public perception surrounding bats. For years, they dealt with a general disdain from the public surrounding the small creatures. 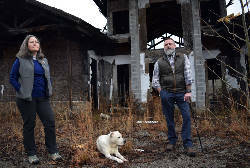 Anytime they heard from the public, it was often asking whether Georgia DNR could help with extermination. That's changed, Morris said. They now hear more regularly from those who support the work and are generally interested in helping control the spread of the disease. That was the same for many of those who attended Saturday. About 200 people, including the 17 conducting the bat study, attended the event. Some just sat outside by the fire, listening to music and catching up with friends while others explored for miles within Frick's Cave. The Southeastern Cave Conservancy Inc., which owns the property where the cave entrance is located, invites its members and their guests to tour the cave for this one day. "It's one of those days that's really about fellowship and enjoying the cave," SCCi Executive Director Ray Knott said. Attendees travel came from afar to visit the cave located about 30 minutes from downtown Chattanooga. One mother and daughter traveled from Tampa, Florida, with an SCCi member from Montgomery, Alabama. The area — referred to as TAG because of its proximity to the spot where Tennessee, Alabama and Georgia meet — is renowned for caving and is one of the world's most cave-rich regions. There are more than 600 caves in Georgia, more than 4,000 in Alabama and more than 10,000 in Tennessee. Tennessee has more caves than any state and about 20 percent of the total caves in the U.S.
North Georgia resident Dan Hudson and his 12-year-old son Eli volunteered for the bat count. The volunteers mainly watched and explored as biologists conducted the research, but Morris explained information about bats, the study and white-nose syndrome in great depth to those watching. Hudson and his son began caving about six months ago as a mutual hobby. The father was fascinated with the trip, while the son enjoyed the exploration, adventures and most of all, finding the creatures inside. 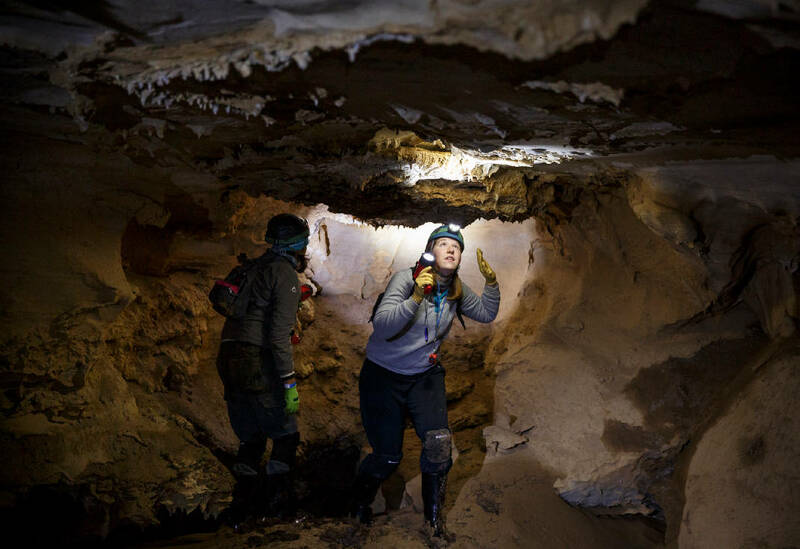 "This is a pretty amazing opportunity to get in and see a cave we have not seen before with a whole group of people who are active in the caving community," Dan Hudson said.